Have you ever seen the shade of green that comes over a grassy hill after a good rain? It’s absolutely electric. 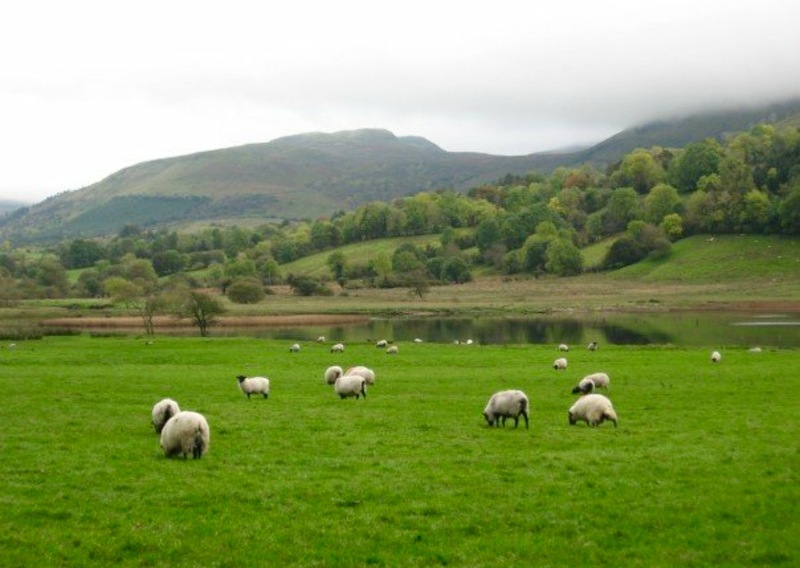 If you’ve ever been to Ireland, where there’s always a mist hanging around the countryside hills, you know what I mean. It’s an almost unearthly hue, and it jolts your senses awake. One of the things I’ve loved discovering about wine is how my senses can get this same “jolt” through just a taste of a wine or pairing that’s perfectly in balance—something that gets me to sit up in my chair a little straighter and take notice of what’s going on in my mouth. It’s at this time of year that all I want from my food and drink is for my senses to be woken up and energized with fresh, new flavors and sensations. 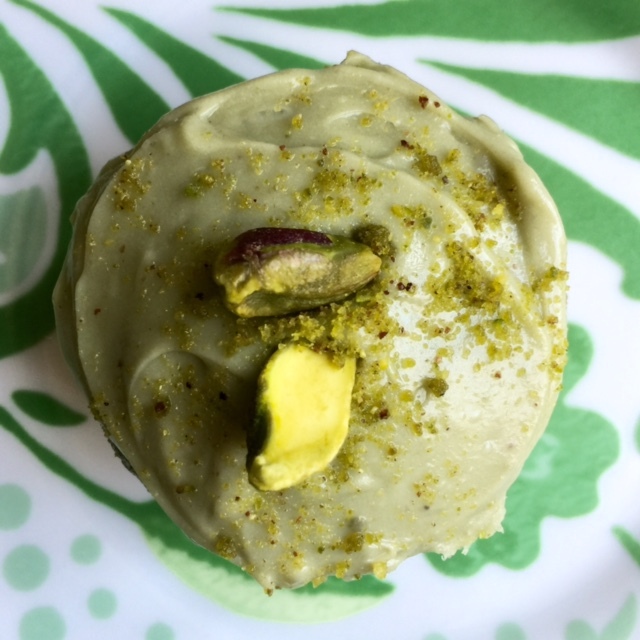 Naturally, our next tasting session had to revolve around just that: All Things Green! We interpreted the “green” part liberally: maybe the wine/food was “green” in the organic sense, green in color, or green in an energized, inspiring way. 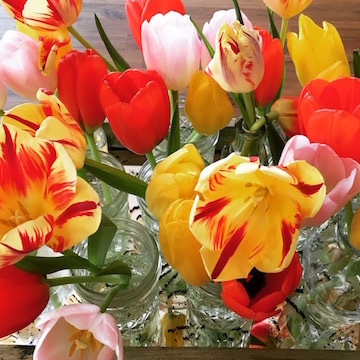 Below, you’ll find some of the highlights from our “All Things Green” gathering… may they inspire you to freshen up your own table this spring! Fritz-Müller Müller-Thurgau Perlwein The Fritz is it! This hard-to-miss label makes a statement as soon as you pour it into your glass. This Perlwein—wine with “pearls” —is a petillant wine, meaning slightly sparkling. The grape Müller-Thurgau is an oft-used German varietal, mainly employed in blends. But when it’s vinified by itself, it results in a gorgeous, high-acid wine that’s perfect for starter courses. And what kind of first courses? Well, try out some homemade pesto, pea + mint puree, or my personal favorite, an arugula + pistachio puree. These dips are super-versatile and pretty forgiving in the prep process, and make for classy, stunning, and incredibly delicious hors d’oeuvres. 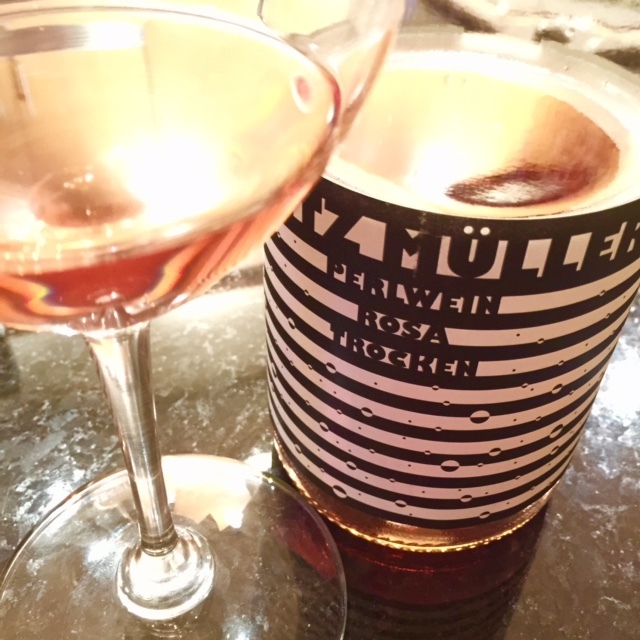 Fritz-Müller “Rosa” Perlwein One Fritz is never enough, so why not throw in a roséoption from the same producer? Made from the grapes Portugieser and Spätburgunder (Pinot Noir, to the rest of us), this effervescent rosé has just the right amount of fruit to balance out the acid, and finishes refreshingly dry. Try out this bottle with some caprese skewers—the pink Fritz mingles perfectly with the tomato and basil flavors. Don’t forget to marinate your fresh mozza in some balsamic! Château la Greffière Mâcon-Serrière “All Gamay comes from Beaujolais.” Nope! Mâcon-Serrièreis the one appellation in Burgundy allowed to make wine from Gamay, and they do a pretty darn fantastic job at it. 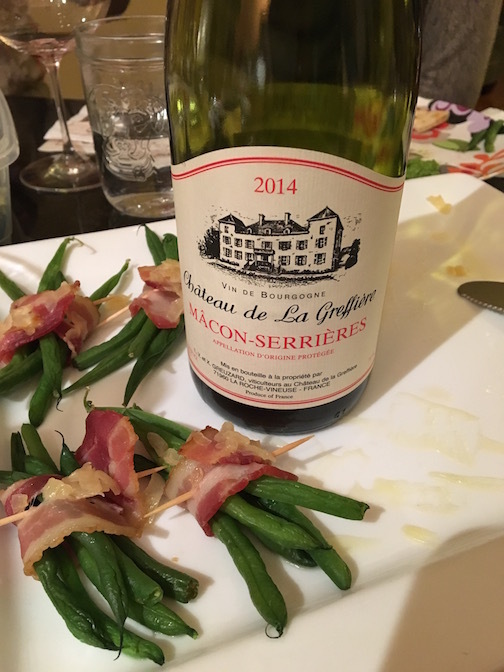 Generally higher in acid and with a bit more of an herbal quality than most Gamay has, this offering from Château la Greffièrehas enough going on to help it stand up to some heavier appetizers, such as our bacon-wrapped green beans or pan-fried pork meatballs with lemon glaze. Make sure to put a little chill on this light red in order for the fruit notes to “pop” a little more! 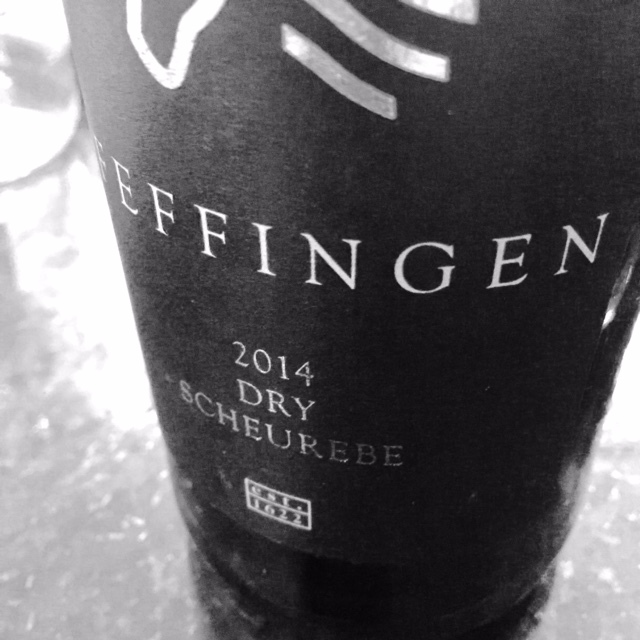 Pfeffingen Scheurebe Oh man, this wine is the embodiment of spring in a glass! The perfect note of the night on this wine was: “a lime Popsicle on a hot summer day.” Smelling of fresh honeysuckle and juicy honeydew melon, this wine grabs every ounce of your attention with its incredible aromas and draws you into its fruit-forward flavors and slightly bubbly texture. Originally paired with Leslee’s lemon-glazed meatballs, this was one of the knockout pairings of the evening! Simčič Sauvignonasse Move over, Germany! This exotic Slovenian wine has some stories to tell. If you’re looking to dig into a wine for a more cerebral experience, this bottle’s the one for you. Medium-weight with an oily texture and layers of anise and honey, this white wine doesn’t have a ton of fruit to it, and therefore goes well with dishes with an herbal motif. 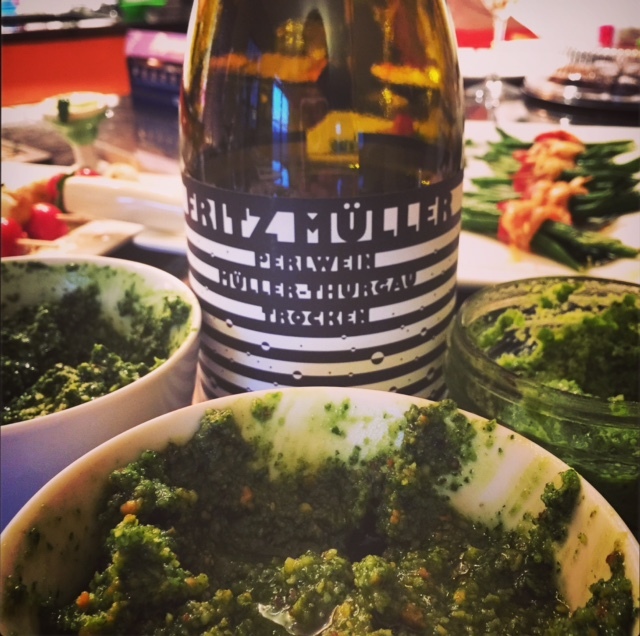 One of the favorite pairings with this wine was the pea + mint puree, along with the arugula + pistachio. As Leslee says, #certifiablydelish! 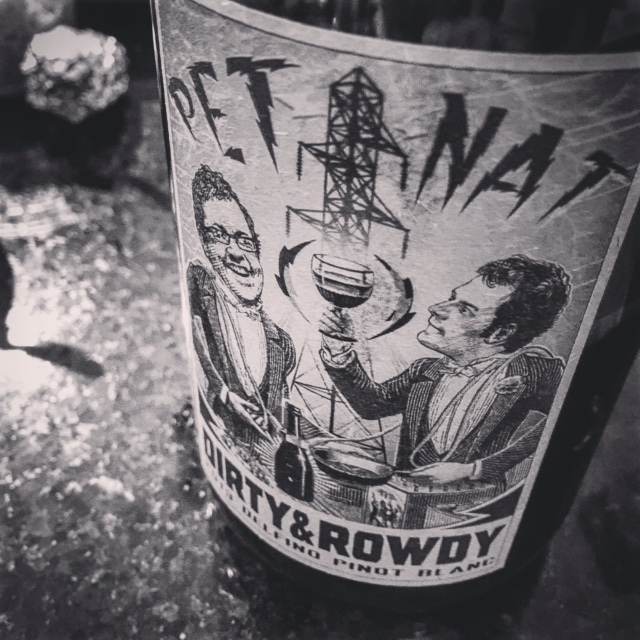 Dirty & Rowdy “Pet-Nat” Pinot Blanc It turned out that “slightly sparkling” was the theme of the night, all the way to the dessert course! Coming from one of the new “Cool Kid” Central Coast wineries in California, this is the whimsical tasting note from the winery’s website: “…the rustic bubbles and primitive joy remind you that you were born to party, outside.” Yes, yes, YES. The slightly sweet note on the back end of this wine matched up perfectly to the not-too-sugary pistachio + matcha cupcakes we served for our final course. The bubbles helped to cleanse your palate of the thick, luscious cream cheese frosting, but somehow we still felt “healthy” after eating such a cheerily green cupcake… so we all went back for a second one. If there’s one major takeaway from this Evening of Green, it’s that you should NEVER underestimate the power of bubbles for food pairing! They’re not just fun and festive to drink—they also serve as palate cleansers and are a great fallback for tough-to-match foods. Here’s to energizing your palate!